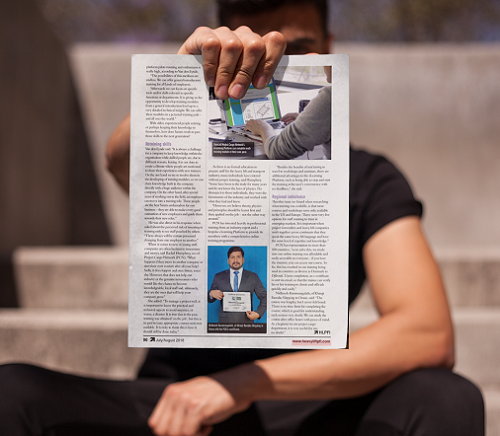 We are delighted to be featured in an article in the July/August 2018 issue of HLPFI magazine on page 96, 'Nurturing Skills to Retain Your Staff', which has a distribution of 20,000 and pass-on readership of 100,000. 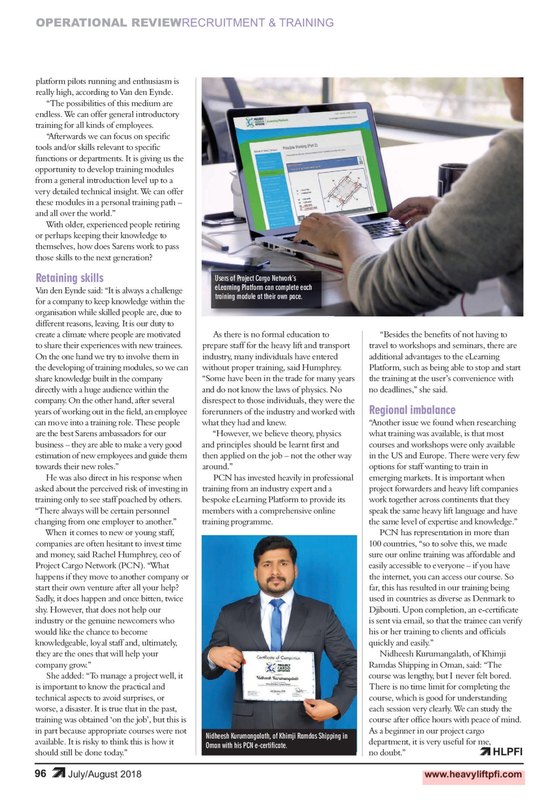 The article (click here) includes a photo of Nidheesh Kurumangalath of Khimji Ramdas Shipping in Oman who is one of over 140 staff members who have signed up for the training. When it comes to new or young staff, companies are often hesitant to invest time and money, what happens if they move to another company or start their own venture after all your help? Sadly, it does happen and once bitten, twice shy. However, that is does not help our industry or the genuine newcomers who would like the chance to become knowledgeable, loyal staff and ultimately, they are the ones that will help your company grow. To manage a project well, it’s important to know the practical and technical aspects to avoid surprises, or worse ... a disaster. It is true that in the past, training was obtained ‘on the job’, but this is in part, because appropriate courses were not available. It is risky to think this is how it should still be done today. As there is no formal education to prepare staff for the heavy lift and transport industry, many individuals have entered without proper training. Some have been in the trade for many years and do not know the physics laws. No disrespect to those individuals, they were the forerunners of the industry and worked with what they had and knew. We believe theory, physics and principles should be learnt first and then applied on the job – not the other way around. Therefore, Project Cargo Network has invested heavily in both professional training from an industry expert and a bespoke eLearning Platform (pcntraining.com) to provide Members with a comprehensive online training program. Besides the benefits of not having to travel to workshops and seminars, there are additional advantages to the eLearning Platform such as being able to stop and start the training at the users’ convenience with no deadlines. Another issue we found when researching what training was available, is that most courses and workshops were only available in USA and Europe. There were very few options for staff wanting to train in emerging markets. It is important when project forwarders and heavy lift companies work together across continents, that they speak the same heavy lift language and have the same level of expertise and knowledge. PCN has representation in over 100 countries so to solve this, we made sure our online training was affordable (from only £150 per user) and easily accessible to everyone - if you have the internet you can access our course. So far, this has resulted in our training being used in countries as diverse as Denmark to Djibouti, Tunisia to Trinidad & Tobago, Namibia to New Zealand, Slovenia to Sierra Leone, Ireland to Ivory Coast, Hungary to Honduras, China to Colombia. To date, over 140 staff members have signed up and we are delighted with the feedback received. When asked to rate the overall quality of the training, 100% said very good to excellent. Most importantly, when asked how much was learnt from the course, 90% said a great deal. With regards to the quality and ease of use of the eLearning Platform, 100% said very good to excellent. As the training is comprehensive, senior level professionals also benefit from the practical, scenario and video-based course as it encourages reflection on current practices. Marco J. van Daal adds “It gives me tremendous joy when experienced project and heavy lift forwarders approach me after training and say, “I have been doing this for 30 years and now I know why”.” For more details, click here.